DCT Gdansk is pleased to announce that on 5th March 2012 it became the first container terminal operator in Poland to receive the Authorized Economic Operator (AEO) certification. AEO is an international certificate established in 2008 by the European Commission to secure a smooth international trade flow accepted by Customs worldwide. Companies and institutions involved in the international movement of goods, such as importers, exporters, forwarders, ports, airports, terminal operators, etc. which have earned this certificate benefit from Customs simplifications as a result of being reliable partners. The certification procedure started at the end of 2010 with extensive preparatory works involving all departments in the Company in order to meet with requirements from Customs Authorities as well as other departments from the Ministry of Finance, and concluded with an in-depth external audit. 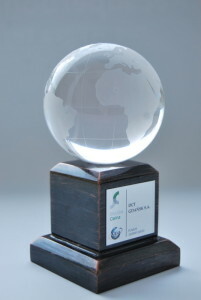 Official giving ceremony took place Monday 26th March 2012 r. in Customs Office in Gdynia, Poland.